ATLANTA – Bauerfeind, a world leader in innovative sports and medical knee supports, and the National Basketball Association (NBA) today announced a new multiyear partnership making Bauerfeind’s GenuTrain NBA an officially-licensed knee support of the league. “We’re very excited about this opportunity to bring our authentic on-court knee supports of the NBA directly to basketball players of all levels,” said Warren Colter, CEO, Bauerfeind USA. The ties between Bauerfeind and the NBA started more than a decade ago when athletic trainers introduced players to the original GenuTrain knee support. The active support has become an integral part of NBA teams’ injury prevention and treatment. 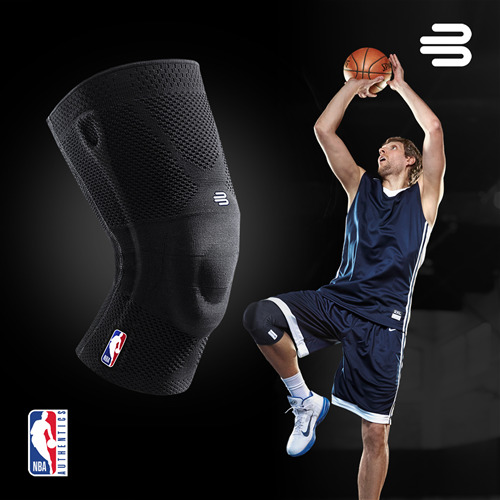 The GenuTrain NBA knee support will be available Dec. 12 at sports retail locations nation-wide and at bauerfeind.com. Other markets around the globe will launch in late 2018 and 2019. For more information, visit www.bauerfeind.com. Founded in Germany in 1929, Bauerfeind is one of the leading manufacturers of sports and medical products including orthopedic braces and supports for every joint and the back, as well as insoles and compression products. Every Bauerfeind product is made in Germany and is designed to help people live fulfilling, active lives, at any age. Top athletes and athletic trainers across the world put their trust in the outstanding quality of Bauerfeind products. Since 2002, the company has been an official supplier of the German Olympic teams and has been a partner of the Olympic Organizing Committees as the exclusive supplier of braces and supports to all participating nations since 2010. GenuTrain NBA is a premium knee support trusted by NBA athletes and professional athletic trainers throughout the league. NBA GenuTrain’s innovative design delivers superior comfort, stability and pain relief to players overcoming injury.